At a recent dinner party with friends, our hostess served a salad that I loved. It is easily adaptable to whatever you may have on hand. She found the recipe on the bag of spinach! Can be topped with chicken (grilled, roasted, or leftover) for a main dish entree. I used to never eat spinach, thinking I wouldn't like it and my Mom eats iceberg lettuce like they're gonna quit growing it, so I must have gotten that from her. I recently heard that iceberg lettuce lays in your tummy for up to 6 weeks 'cause it's so difficult to digest! Don't know if that's true…and how did I get so far off the topic of your waldorf salad?!?!? I'm getting old…please forgive!!! ha! ha! And, yes…Hallelujah Christmas is truly AWESOME and it just does something to our hearts…I told somebody it even makes my arms tingle!!! Wonderful looking salad, and I LOVE it. I can always count on your for some yummy recipes. This one looks great too. This looks delicious. I do like adding cheese, fruit to salads, too. I should check out Peddlar's Village someday! Sounds wonderfully delicious, I am now book marking it to print later, thank you for sharing. This salad looks wonderful! 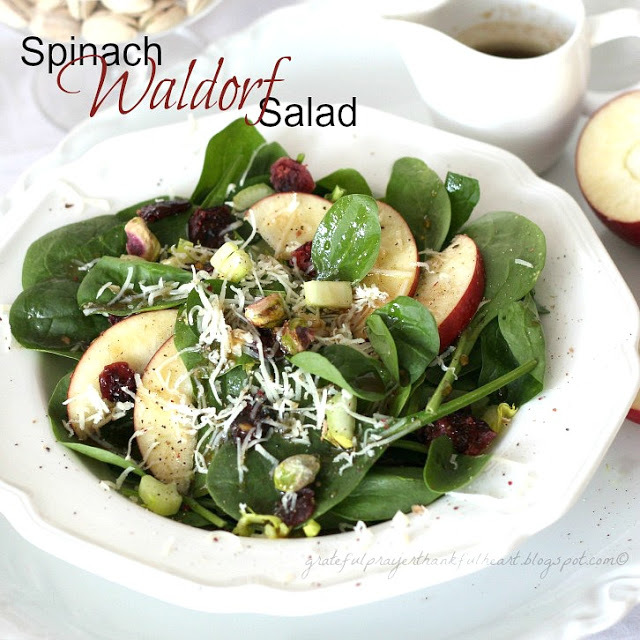 I love fruit in my salad, especially with spinach, and the dressing sound easy and good! Almost every recipe I've found on bag of food (mostly chocolate chips, etc.) have all be delicious. This sounds delicious. 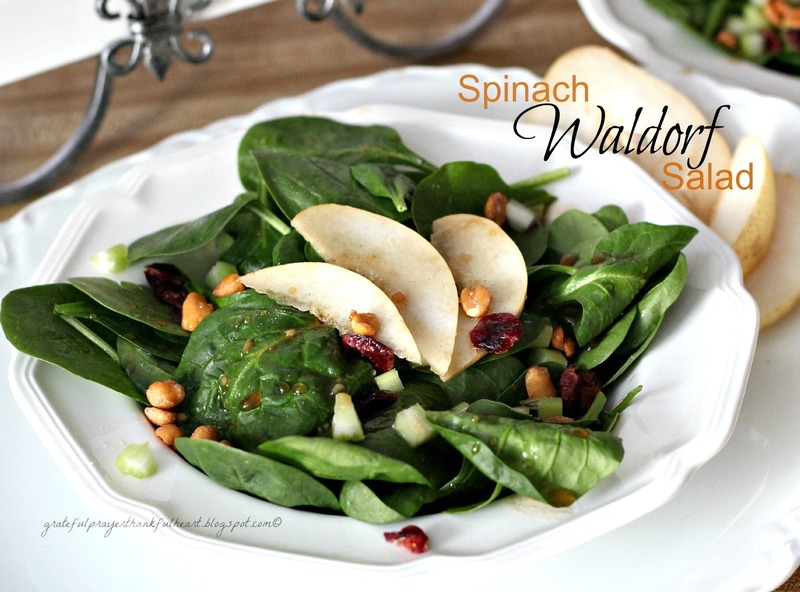 I have always loved Waldorf salad and I like the addition of the spinach here.